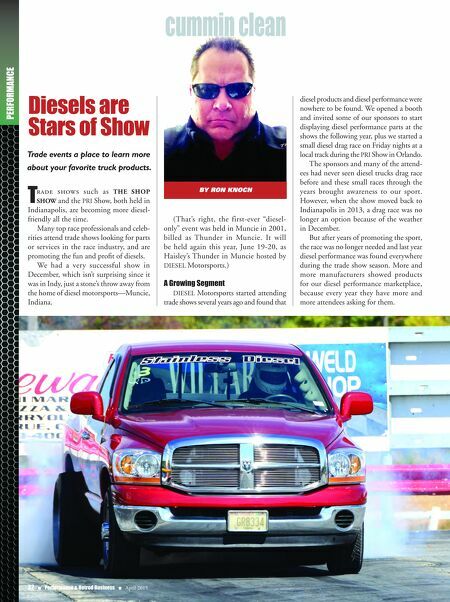 April 2015 n Performance & Hotrod Business n 33 Diesel Discussions DIESEL Motorsports has had success at shows with the DIESEL Motorsports girls in our booth, as well as by hosting a new diesel discussion panel seminar. I acted as the moderator for the first one last year, with panelists from manufacturers to diesel shops to competitors participating. Representing the manufacturers were Karl Dedolph from Champion Oil and Todd Green from Firestone's Ride Rite Division. Rick Smith from Dave's Diesel Angola represented a diesel shop, while Dmitri Millard is a competitive racer who agreed to lend his thoughts. Most of the discussion surrounded die- sel performance trucks, which are trailered to events and are EPA-compliant as unli- censed/unregistered competition vehicles. The discussion panel discussed the most important components in making more horsepower for these vehicles in order to compete on a higher level. We discussed air and fuel intakes, and the drivetrain issues of converting that power to the wheels. Another important issue was the con- version of European diesel technology over to domestic U.S. diesel vehicles. It seems the European nations have much more advanced technology when it comes to the More and more diesel products are appearing prominently at industry trade shows. 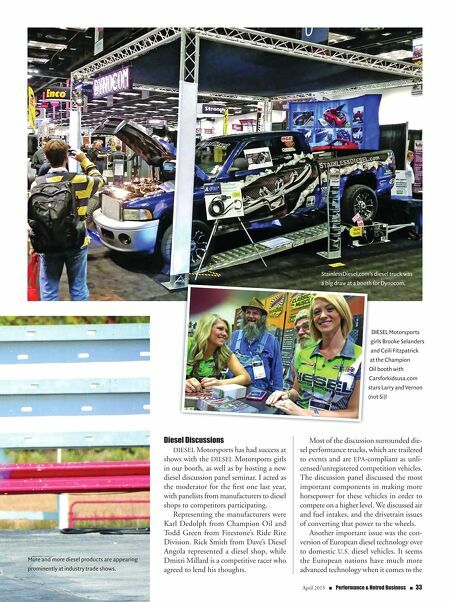 StainlessDiesel.com's diesel truck was a big draw at a booth for Dynocom. DIESEL Motorsports girls Brooke Selanders and Ceili Fitzpatrick at the Champion Oil booth with Carsforkidsusa.com stars Larry and Vernon (not Si)!